North Carolina senators took a key step in delivering long-sought relief on a class size mandate to the state’s public school districts Friday, but Democrats denounced the “Frankenstein’s monster” bill for its inclusion of multiple partisan jabs at Gov. Roy Cooper. The amended version of House Bill 90—which was rolled out Thursday and passed in the Senate Friday by a 37-5 margin—retains the “status quo” on K-3 class size caps in the coming year, and phases in reduced class sizes in the following three years. Members of the state House of Representatives aren’t expected to consider the conference report until Monday or Tuesday. The deal, which was negotiated behind closed doors in recent weeks, also budgets about $61 million in recurring spending on so-called “enhancement” teachers, the arts, music, language and P.E. teachers whose jobs were so imperiled by lawmakers’ 2016 mandate to slash K-3 class sizes. “This bill gives us a reasonable pathway to smaller class sizes,” said Sen. Tamara Barringer, a Wake County Republican who says she was involved in the behind-the-scenes negotiating that yielded this week’s pact. But Democrats admonished Republicans, arguing that without controversial provisions aimed at merging state elections and ethics boards and controlling how $58 million in Atlantic Coast Pipeline mitigation funds are spent, the legislation would have passed unanimously. 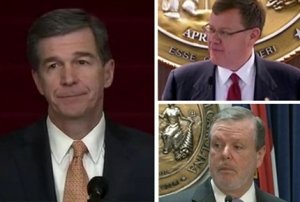 Republicans are already mired in an ongoing court battle with Cooper over their effort to curtail his party’s majority on the Board of Elections, although the state Supreme Court ruled in Cooper’s favor last month. The bill would add a ninth member to the panel unaffiliated with any party, but continues to seek an even party split on the remaining eight seats. Previously, the governor’s party was guaranteed a majority on the board. The legislation’s other sticking point centered on GOP legislators’ effort to control how pipeline mitigation funds are spent. Cooper announced the creation of the fund, donated by energy companies that benefit from the pipeline, around the same time as the controversial pipeline got the green-light from his administration. The governor’s office says he will control the fund, although legislators say he has overstepped his authority. Republicans have also accused Cooper of striking a “quid pro quo” deal with energy companies, providing pipeline permitting in exchange for the environmental mitigation cash, a charge Cooper denies. Despite their criticism, most Senate Democrats voted for the proposal Friday. Yet those who did expressed heartburn about its hybrid approach to packaging multiple hot-button issues in one conference report. “When you put these provisions in this bill in this manner in which it is, you make it unfair. You make it political,” said Sen. Erica Smith, a Democrat representing multiple counties in eastern North Carolina. Republicans countered that the legislation simply bundles together multiple pressing issues that needed to be addressed in a timely fashion by the legislature. “I cannot see the reason why it has been demonized,” said Sen. Ralph Hise, a Republican representing several western North Carolina counties. Sen. Chad Barefoot, a Wake Republican who led class size negotiations for the GOP-dominated chamber, said dissenting Democrats were indicating greater loyalty to Cooper than the public schools. Despite the back and forth, Democrats said Republicans were to blame for the long-running, class size consternation, claiming that GOP lawmakers ordered smaller K-3 classrooms without providing sufficient funding.